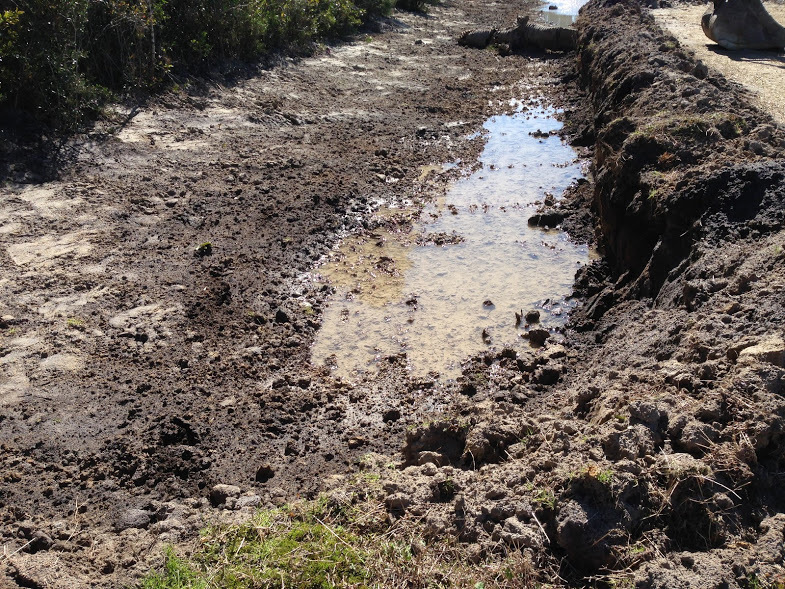 North River Wetlands Preserve is currently closed to the public while undergoing its final stages of restoration. 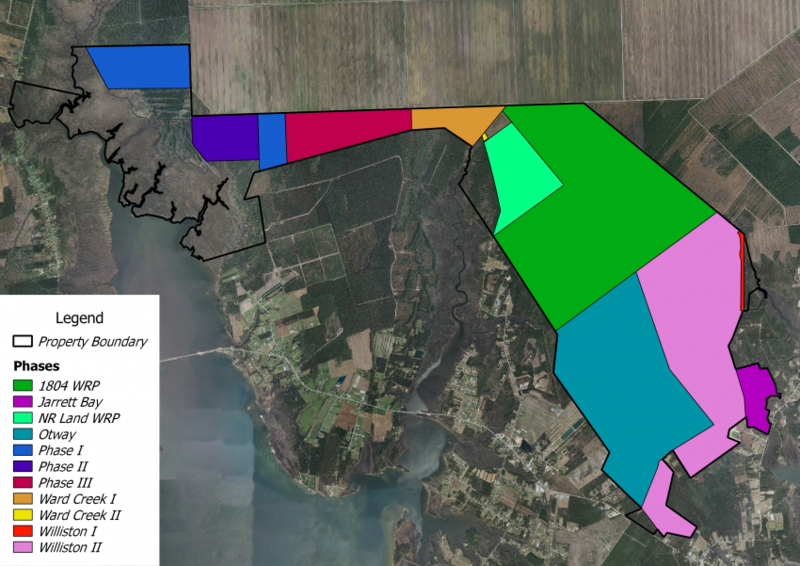 The North Carolina Coastal Federation’s 6,000-acre restoration project at North River Farms in eastern Carteret County is one of the largest wetland restoration projects in North Carolina and is among the largest project of its kind in the nation. The primary goal of the project is to return farmland back to its original state – forested, freshwater and tidal wetlands – in order to improve the water quality of degraded downstream estuaries and reopen these waters for shellfishing. The re-created wetlands are retaining, filtering and providing natural treatment of agricultural runoff from remaining upstream farmland. They are also effectively restoring watershed hydrology, trapping sediments, converting nutrients and preventing other pollutants from reaching the downstream coastal waters. The project began in 1999 with help from the previous owner, the N.C. Clean Water Management Trust Fund, various agencies, lots of volunteers and our members. About 3,000 acres of farmland have been restored by the federation and its partners so far, and another 1,200 acres of existing forested wetlands and marshes have been preserved in perpetuity. Wetland restoration of the remaining 1,800 acres of farmland on the property is ongoing. North River Wetlands Preserve, which is located at N River Farms Road in Otway, is open to the public. You can gain pedestrian-only access to this 6,000-acre preserve for free if you’re a member, or for a small fee of $5 per day if you’re a non-member. The preserve is open for hiking, biking and other pedestrian activities. Visitors must park before the gate, sign in at the kiosk and walk around the gate to access the preserve. Drop your payment in the cash box and take a ticket, or register online and sign the waiver at this link. The Mountains-to-Sea Trail is a state trail that runs from Clingmans Dome in the Great Smoky Mountains National Park all the way to Jockey’s Ridge State Park. 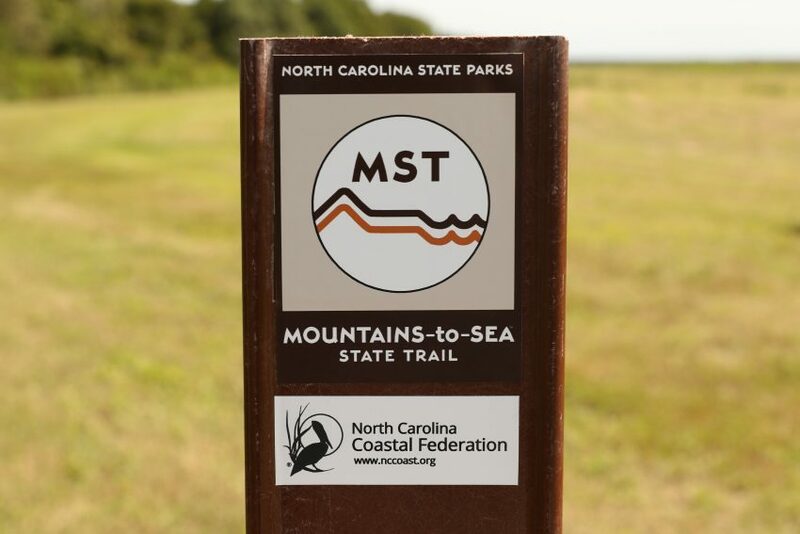 The NC Trails Program, which is part of the North Carolina Division of Parks & Recreation, partnered with the federation to route the trail through the North River Wetlands Preserve. The 8 miles of trail running through the preserve were dedicated in 2017 and the federation is currently working to help connect this segment of the Mountains-to-Sea Trail to a more accessible point. For more information about the trail, call 252-393-8185. Through grants from the N.C. Clean Water Management Trust Fund, the federation bought 1,991 acres (Tract 1) of the farm in 1999 and 2,168 acres (Tract 2) in 2002. That same year, Restoration Systems LLC, an environmental restoration and mitigation company, bought 385 acres (Tract 3) and the 1804 Wildlife Partners LLC, a private hunting club, bought the remaining 1,435 acres (Tract 4). These two partners restored their tracts to wetlands by enrolling them in the United States Department of Agriculture Natural Resources Conservation Service Wetlands Reserve Program (WRP), now the Agricultural Conservation Easement Program. In 2013, the federation also enrolled Tract 2 in the WRP and purchased Tract 4. 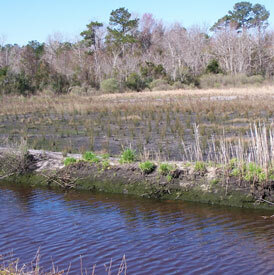 The federation has performed the wetland restoration of North River Farms in various phases. On Oct. 12, 2017, the federation completed a salt marsh restoration project at the headwaters of Williston Creek at the preserve. Nine volunteers and four staff members participated in the volunteer salt marsh restoration event, where they planted 2,006 plugs of Spartina alterniflora (smooth cordgrass), Spartina patens (saltmeadow hay) and Juncus roemerianus (black needlerush). This salt marsh restoration project began in February 2017. The goal of the project is to restore 8.8 acres of salt marsh as well as 3,500 linear feet of tidal creek. 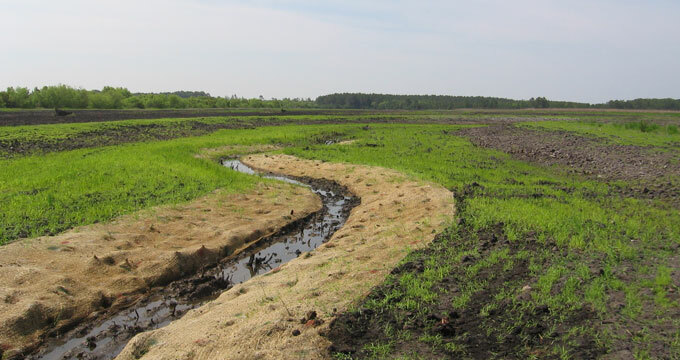 The salt marsh restoration will help make the Williston Creek healthier by filtering out pollutants from a nearby farm, thus improving water quality of downstream estuaries and improving the quality of shellfishing waters. The salt marsh restoration project was funded by a $91,430 Bring Back the Natives grant from the National Fish and Wildlife Foundation, along with private funds that were raised by the federation. In 2018, construction is set to begin on Williston Phase II and Otway Phase I (see map below). Williston Phase II was designed by AECOM, and Otway Phase I was designed by engineers from the Natural Resources Conservation Service (NRCS). Both these tracts are in the Wetlands Reserve Program (WRP) through NRCS. A map of the various tracts. Click to enlarge. Various restoration phases. Click to enlarge. The Williston Creek salt marsh will improve downstream water quality and provide fisheries habitat. Restoration techniques: Enhanced tidal creek flow and sinuosity, and improved floodplain grading. Planted 2,006 wetland plants that included Spartina alterniflora (smooth cordgrass), Spartina patens(saltmeadow hay) and Juncus roemerianus (black needlerush). Acres restored: 3 acres of brackish marsh and 725 linear feet of tidal stream. Restoration techniques: Restoration of brackish marsh and tidal stream. Restoration techniques: Restored to bottomland hardwood forest and a tidally influenced brackish marsh. Restoration techniques: Restored to forested wetlands and waterfowl impoundments. Mimicking the natural drainage is key to successfully restoring the hydrology of the tract. 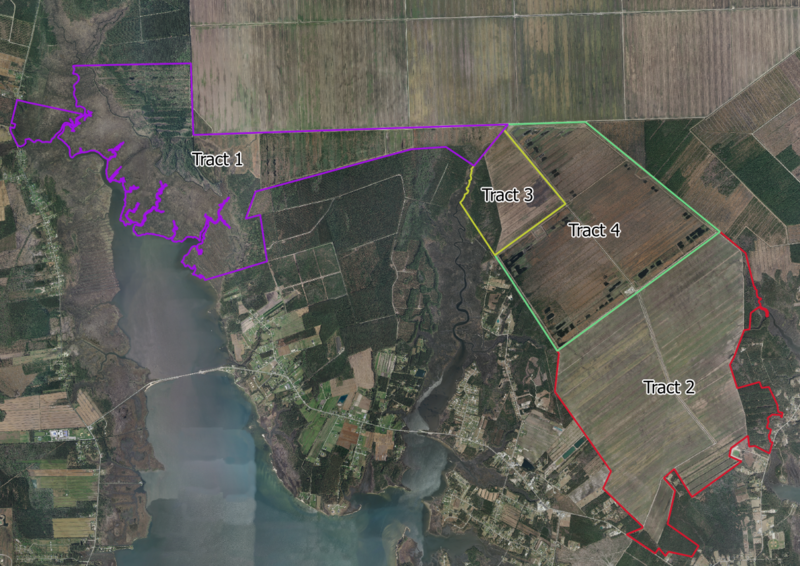 A plan, below left, was drawn to turn more than 200 acres of flat cropland into a forested wetland bisected by a creek and tidal marsh. The rudimentary creek takes shape, above and looks more natural later when the marsh grasses mature. 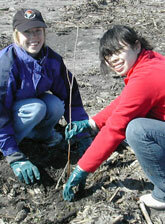 The students plant a tree. The map shows the 116 acres along Ward Creek that was restored into forested wetlands and tidal marsh. Funding: N.C. Clean Water Management Trust Fund, U.S. Fish and Wildlife Service, North American Wetlands Conservation Act and national partnership between the National Oceanic and Atmospheric Administration Community-Based Restoration Program and Restore America’s Estuaries. The map shows the restoration that our partners in the project will undertake. Saltwater grasses were planted along the creek to create the marsh. Acres restored: 250 acres of forested wetlands and 1.25 acres of brackish marsh at two locations. Restoration techniques: Different types of restoration techniques were tested. The ditches in some farm fields were simply plugged and filled. In other fields, the crowns were removed and the fields leveled and in others bulldozers created contours in the flat fields. Five structures were built to control water and wetland vegetation planted. Construction of these restoration phases was performed by Backwater Environmental. 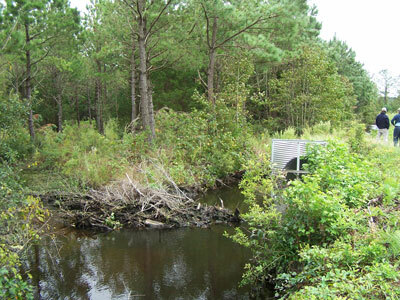 With the exception of Jarrett Bay Watershed Phase I, all phases of the North River Farms Wetland Restoration Project were monitored and researched by Duke University Marine Laboratory, N.C. State University’s Biological and Agricultural Engineering Department and by the N.C. Shellfish Sanitation Section. Other project partners include: 1804 Partners LLC, Restoration Systems LLC, N.C. Coastal Land Trust, N.C. Natural Heritage Program, The Nature Conservancy and Open Grounds Farm.